I've been crazy about capybaras for as long as I can remember. To give you an idea of how long, I wrote the first web page about them that ever existed. The lovingly fossilized design of that page will make you nostalgic for the internet of the late 1990s, if you're old enough to remember it. This means that I've spent years having to explain, over and over and over again, what a capybara is. I wouldn't have this problem if I lived in Japan, where the capybara is as famous and beloved as it truly deserves. The capybara is the world's largest rodent. The minute you mention this, people immediately think "giant rat." Then it's an uphill battle to convince them of what an adorable and awesome animal it is. 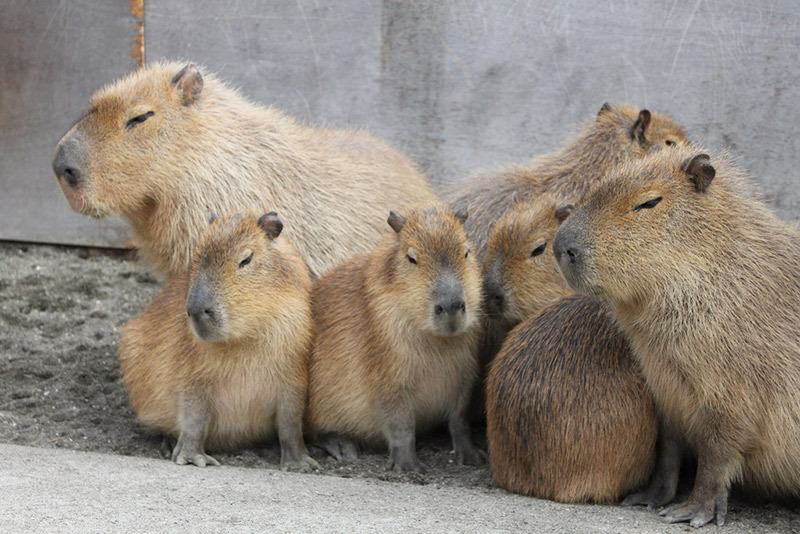 If the capybara were a giant rat, actually there'd be nothing wrong with that. Rats are pretty awesome animals also – they're intelligent and sociable and make great pets. But in fact, capybaras are more closely related to a different pet rodent: the guinea pig. Look at the nice square shape of both of them and you'll see the family resemblance. However, capybaras are MUCH larger: on average about a hundred pounds, two feet tall, and four feet long. Yeah. Stop and think about that for a moment. Awesome, right? And unlike most familiar rodents, capybaras are semi-aquatic. They've got a number of interesting adaptations for this lifestyle. Their feet are slightly webbed, which helps with swimming and walking on waterlogged ground. Their ears, eyes and nostrils are set on the top of their head, so they can swim almost totally submerged (for a more familiar example, think of how a hippo swims with just the top of its hear showing above the water.) They can also hold their breath to stay underwater for up to five minutes. Another significant fact for our purposes here: they are definitely not native to Japan. They're found in the southern parts of Central America and northern South America. Why are the Japanese mad about capybaras? I could just attribute it to the fact that they're the world's experts in kawaii, and capybaras are so totally obviously adorable. But still, to think they're cute, people ha ve to know about them in the first place. There weren't even any capybaras in Japanese zoos before 1970, when the Ueno Zoo got some from Uruguay. So it's curious that people are familiar with them when we in the US, though much closer to its native habitat, aren't. A lot of the credit should probably go to two places that were early leaders in the field of capybara appreciation in Japan. Each started a uniquely Japanese capybara tradition that has spread across the country. Back in the 1980s, keepers at Izu Shaboten Park, a botanical garden and zoo located in Shizuoka, were inspired to combine the semi-aquatic nature of the capybara with the semi-aquatic part of Japanese culture: they gave them an onsen. 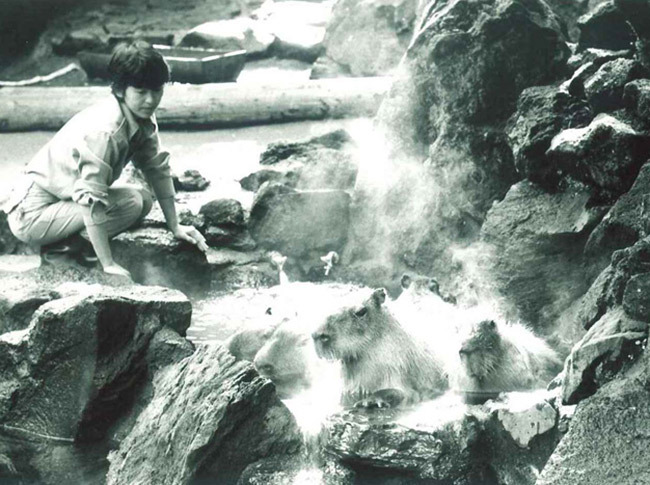 In the winter of 1982, we were washing the capybara's exhibit area with hot water when one of the staff noticed the capybara relaxing in a puddle that had formed. From that we got the idea of making an onsen for the capybara so they could bathe in it. This is such an obviously brilliant idea that it's since been widely imitated and they even get the traditional yuzu bobbing in their baths in the winter. Another center of Japanese capybara devotion opened in the 1980s: Nagasaki Bio Park, which one blog calls "the Holy Land of capybaras." Nagasaki Bio Park was designed specifically for close-up encounters with animals. Here, visitors can enter the enclosure with the capybaras, hand-feed them, and pet them. We'd never have capybara onsen in the US because we don't have onsen, but we'd also never have capybara petting pens, for a couple of reasons. One is that petting animals has become more or less politically incorrect in the zoo business here. Wild animals are supposed to be kept wild, even if there's no chance they'll ever be released into their natural habitats, and in my jobs at zoos, what was technically called "animal contact" was frowned upon and strictly regulated. This attitude doesn't seem to be shared in Japan, luckily for the capybaras, who from the look of videos like this one seem to enjoy the scratching and belly rubs. The other reason that we don't get to know capybaras up close at US zoos is that we've got lots of lawyers, and capybaras have lots of large teeth. Even at the BioPark, parents with small children have to listen to a keeper give them a warning talk before entering the enclosure – but if they decide it's OK, they can go ahead in. Especially exciting is hand-feeding large animals such as rhinos and hippos. It's an experience you cannot expect in every day life. Yeah, that's for sure… But thanks to the exhibit at Bio-Park, petting capybaras has become so popular in Japan that it's almost getting to be something you can expect in everyday life. It's now possible in quite a number of other places, such as Nasu Animal Kingdom in Tochigi prefecture, and a friend recently made me very jealous by sending me a photo of her son petting and hand-feeding a baby capybara at Elephant Kingdom (Ichihara Zou no Kuni) in Chiba (more about this later). 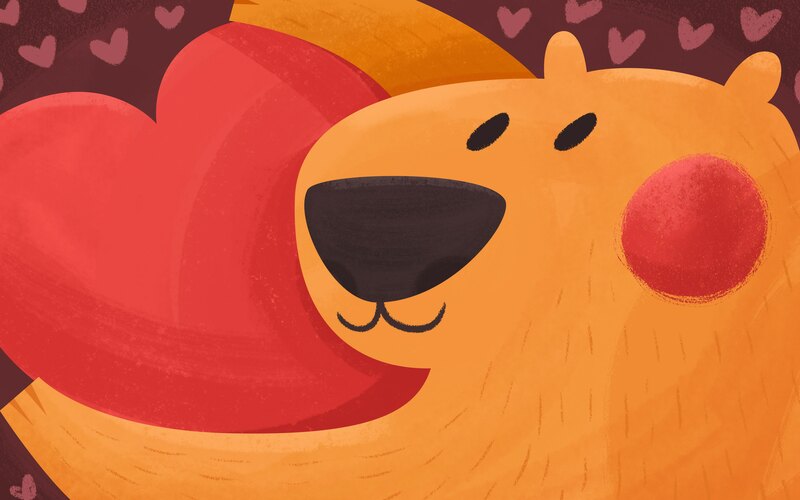 So despite the fact that Americans are much nearer to the capybara's homeland, the Japanese have had much more opportunity to get to know capybaras, and thus to learn to appreciate their somewhat unconventional but undeniable charm. Capybaras have really taken off in the last ten years or so, since the real animal merged with another major Japanese cultural tradition: the cute anime character. Kapibara-san was first introduced as a prize in game arcades in 2003. It became popular enough that after a couple of years the company that created it, called Tryworks, started selling products with the character including books and stuffed toys. Kapibara-san is far from an anatomically correct scientific illustration of a capybara. The company's explanation is that when the designer randomly drew a capybara for a presentation, she didn't remember exactly what one looked like. This strikes me as a sort of implausible and unnecessary origin legend. All you need to do to explain Kapibara-san is to take the basically rectangular shape of a capybara and put it through the universal animal kawaii-processor that softens all the rough edges of a critter. It's basically the same way we got our not-very-realistic teddy bears (or, taken to an extreme, a cartoon aardvark with no snout at all.) But that's their story and they're sticking to it. In 2006 Tryworks introduced a website and additional characters in the Kapibara-san world, which include another South American animal, a llama, and some very round birds. 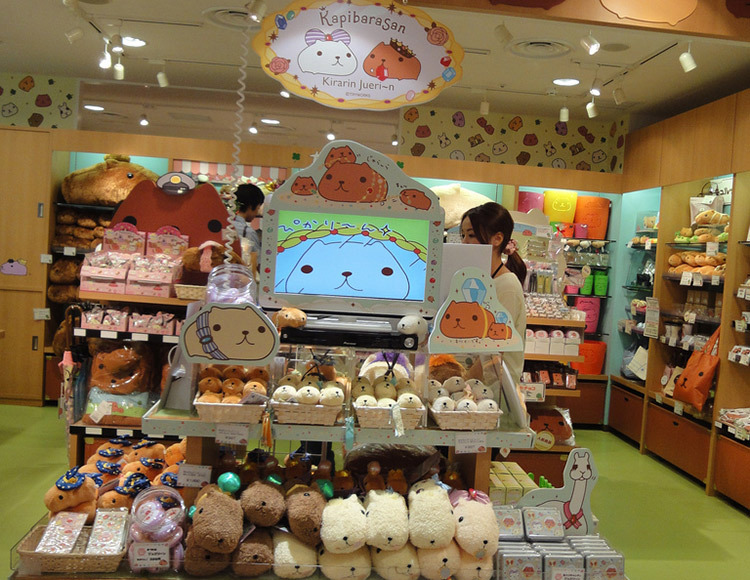 You can buy a full range of Kapibara-san products, including – just looking around my own house now – calendars, towels and washrags, stationery, candy, refrigerator magnets, cell phone charms, and quite a number of other things that I decided I couldn't fit in my suitcase on my last trip. If you want to shop efficiently for Kapibara-san goods, head for the Tokyo Station Character Street shopping area, where Kapibara-san has its own store, right alongside world-famous, iconic Japanese characters like Hello Kitty. Many others have now seen the commercial potential in the capybara craze. 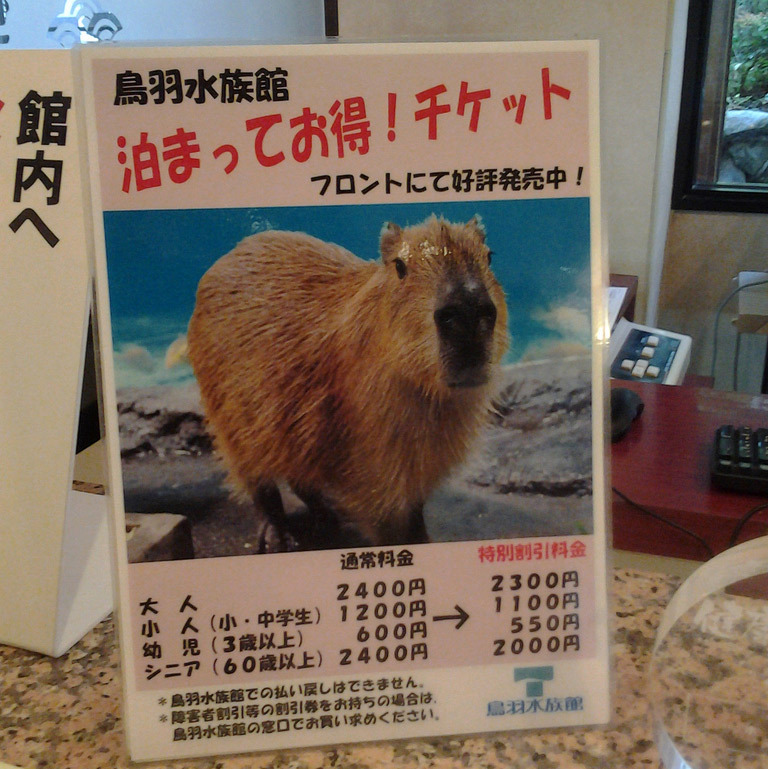 A couple of years ago I checked into an onsen hotel in Toba in Mie Prefecture, and on the hotel desk there was a sign with a picture of a capybara. For a moment I thought this was an elaborate joke that my friend, knowing my obsession, had somehow convinced the hotel to play when she made our reservation. But the sign, which was there to announce that the local aquarium had recently acquired capybaras, had nothing to do with me. The aquarium apparently thought it was enough of a selling point to attract the average Japanese visitor. Along with the live animals the aquarium had many capybara souvenirs, including sweets in a capybara-shaped box, quite a large number of stuffed toys, mugs, and t-shirts (which, disappointingly, only came in children's sizes). Other zoos, aquariums, and museums have taken up the challenge with ingenuity as well. Saitama Children's Zoo sells ramen with a capybara on the package (don't worry, no capybara were harmed in its manufacture – it's yuzu flavored). I also stumbled across fantastic capybara souvenirs in places that only had the most marginal connection to the critters, like this fabulous fan from the National Museum of Nature and Science in Ueno Park. 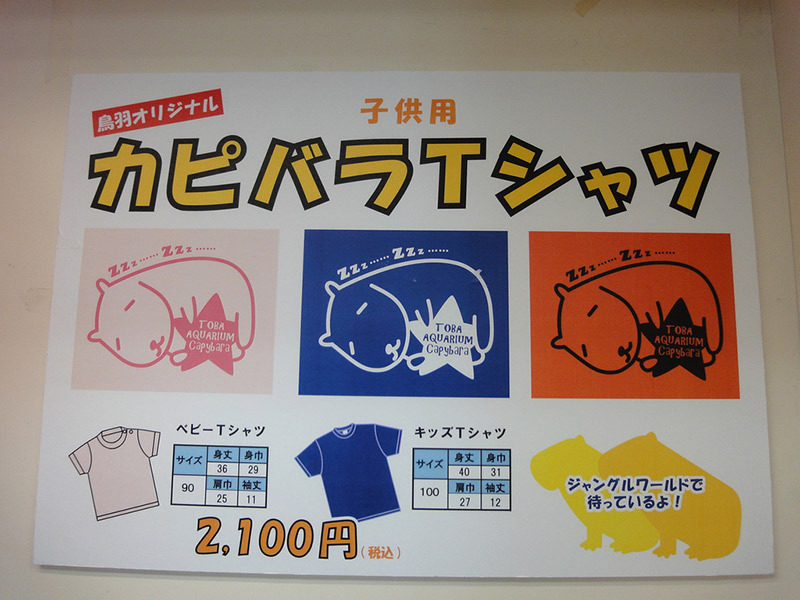 And while this isn't something you can buy, it's worth noting that Izu Shaboten, originator of the capybara onsen, promotes them in what's now a traditional Japanese fashion: with people in huge capybara mascot suits. 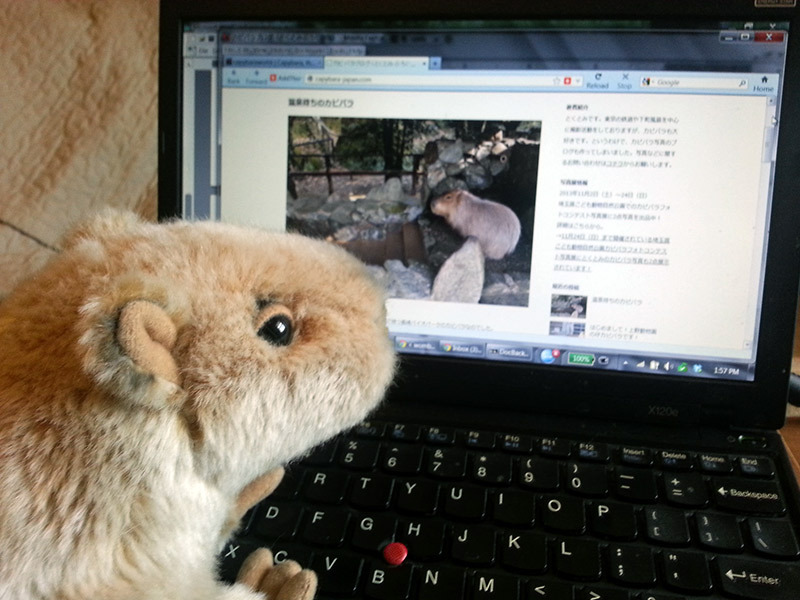 There's also an incredibly detailed website where you can find out where to see capybaras in Japan. It's in Japanese, but if you can't read it, you can get enough of the gist via Google Translate to help get you started on your capybara pilgrimage. You can even find out where you can pet capybaras – in addition to the places already mentioned, a couple more are at Izu Animal Kingdom in Shizuoka and Fuji Safari Park. There seems to be at least twenty, although it was hard to count, because I was so jealous and so sorry I don't live in Japan that I couldn't think straight. There are photos, links, and lot of details about the capybara contact situation for the places the blogger has visited. 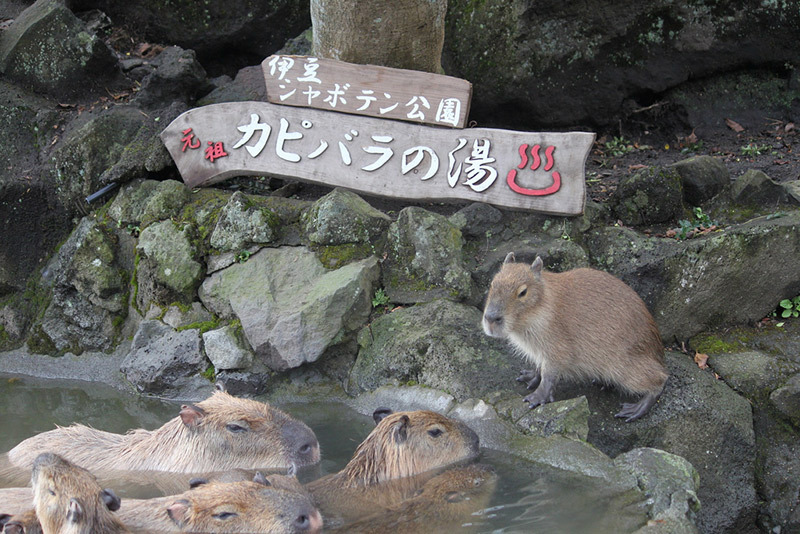 Finally, the site also has a list of where you can go see capybara onsen. So what are you waiting for? Go! And send me pictures!